The latest test flight for Project Morpheus, NASA's prototype for a flight-capable planetary explorer, was successful! The autonomous vehicle flew a pre-programmed trajectory and performed a hazard detection search to identify a safe place to land in a bumpy field. Morpheus detects a safe landing zone in a field full of treacherous rock piles. Image extracted from NASA video. NASA's Morpheus Project is all about developing a prototype planetary lander that can both take off and land. In the future, the hope is to load it down with all sorts of fancy scientific instruments, making it into a craft for aerial reconnoissance on alien worlds. By separating the flight platform from the instrument load, new technology can be loaded in as needed, dropping development costs. The previous test flight demonstrated that the craft was capable of automated takeoff, manoeuvring around a pre-programmed trajectory, and landing safely. Today's test flight added a new wrinkle: testing out automated hazard detection and avoidance, a key skill for reducing risk to crews and landers. After climbing to 800 feet in elevation, the lander performed the search-loop before landing with its typical panache of highly photogenic controlled explosions. Here's the full test video, including shots from a distance mixed with fixed-camera view from within the lander. The hazard-detecting searching starts at 0:30, with the white block scanning the ground below, then cutting to the view of the search-area. It works, and Morpheus detects a safe zone in the rock piles, and comes back for a safe landing. The multi-center, integrated Morpheus/ALHAT team successfully completed Free Flight 12 (FF12) at the KSC SLF on Wednesday, April 30, 2014, Bravo's 10th and ALHAT's 3rd free flight. The autonomous Bravo vehicle flew essentially the same pre-programmed trajectory as in FF11 (800+ ft height, 1300+ ft downrange), with one significant exception; Bravo closed the loop on hazard detection and flew to the ALHAT Hazard Detection System (HDS) identified safe site. 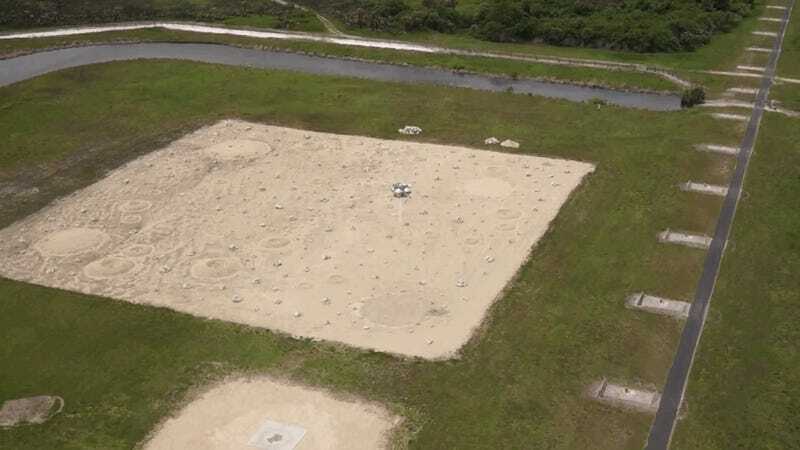 The ALHAT HDS identified its primary safe landing site 1.4m (4.5ft) east of the pad center and the vehicle then targeted that location for landing. FF12 was the 3rd free flight with ALHAT running in open-loop mode, using its sensors to calculate navigation solutions in real time during flight, though not yet actually navigating the vehicle. Bravo GNC flew the pre-planned trajectory, with the exception of targeting the HDS identified landing site. The Morpheus Project blog has an extended write-up on what goes into a typical test-flight day — it's a cool read for the behind-the-scenes setup and preparation that all leads up to a few minutes of flight. Hopefully they'll upload some photos from today's test to their album soon; the Morpheus is as pretty as rocket launches, but with twice as many gorgeous moments and a way cooler aesthetic!